The IEC Knob Style Glide in steel and stainless steel is ideal for light and medium duty load requirements. 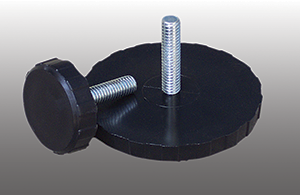 These low-profile, solid bottom, large diameter black polypropylene base glides are perfect for leveling and stabilizing furniture, racks, instruments and appliances without the need for tools. The unique rigid design can withstand failure when subjected to “drop-tests” and excessive tilting. Useful in both feet and knob applications. Special thread lengths can be specified and easily manufactured. Top hex (-HX) and slot standard (-SL) on some sizes. Top slot can be added to any item, add (-SL) to part number.